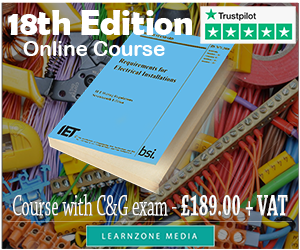 In order to become a qualified electrician, one must gain the 17th Edition of the Wiring Regulations qualification. The easiest route to achieving this is to undergo a short course provided by one of the City and Guilds accredited training providers located within the UK. We have complied a comprehensive list of training providers who offer this valuable course. We have arranged them according to geographical location within the UK. We have also enquired about the cost of a full 17th Edition training course with each of these centres so you can easily compare the costs of taking a course with any of these centres. Also, as always, we encourage our users to feel free and comment about their experiences with any of the mentioned course providers. Please select your region within the UK and you will see a list of 17th edition course providers within your reach. Why not try an online course? One of the best is the 17th Edition online course by LearnZone Media, which we recommend based on its excellent quality, content and value for money. Read our full review here.